Manuel (Manny) Weiss is the Director of Marketing and Co-founder of Codeship. This week, we had the chance to sit down with Manny to discuss his background, why he likes working for Codeship and much more. Let’s get some background information about yourself! My name is Manny, and I’m the Director of Marketing and Co-founder of Codeship. I was born and raised in Austria/Vienna but I am working from our Boston office nowadays. What did you do prior to joining Codeship? My education is in Graphic Design and Advertising. After graduating I was self-employed for 3 years and mainly coded websites and did some creative work like short image videos for some customers. What do you do at Codeship? I manage our lead generation and especially focus on our Inbound Marketing (read about some of the stuff I’m doing here). I manage our blog, and our ebooks and webinar programs. It makes me really happy when readers and users engage with us and tell us our educational material is valuable to them. I co-founded it, and I saw the company and myself growing a lot. There are constantly new challenges and amazing opportunities to grow personally and professionally and to provide value to the amazing community of software developers. 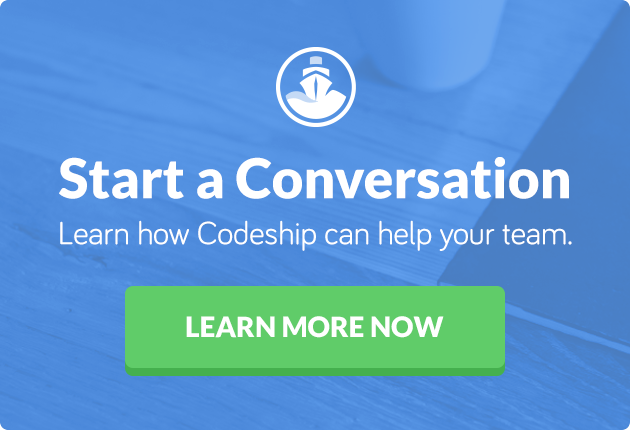 Why should others join Codeship? I encourage you to join our company because we have an enthusiastic, diverse team that provides you with an environment to grow. If you are interested in joining us you can find our latest job openings here. Come join our team! I love reading philosophy books and playing and learning new music instruments. I enjoy watching soccer; I’m a big fan of Liverpool FC! I am also interested in mathematics and wish I would be able to take more time to get more serious about learning it more. I do not have a pet but I’m starting to fall more and more in love with Welsh Pembroke Corgies. I was one of the better table-tennis players in Austria back in the day. It was a lot of fun and it’s a sport I still enjoy playing a lot.